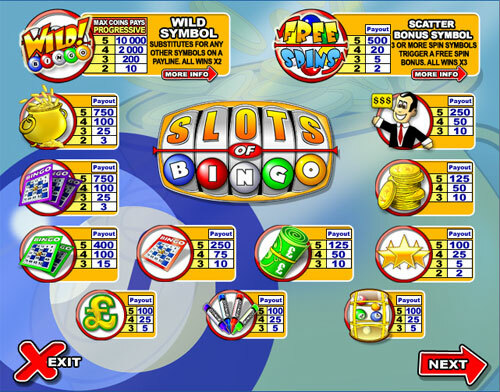 Slots of Bingo pays out when winning symbols match up consecutively from left to right on the same payline, as per the paytable. The player shall only be paid out on the highest win on any given pay line. All wins occur on selected lines only, except scatter wins, which can pay out anywhere on the screen. Slots do not have a 'Play for Fun' feature. The game is a progressive 5 reel 9 line Slot game with Free Spin Bonus game. Min Min coin size = 2c, and Max coin size = 50c. The player shall win a Scatter Pay award as per the paytable if he gets at least 2 Scatter symbols ANYWHERE on the screen. 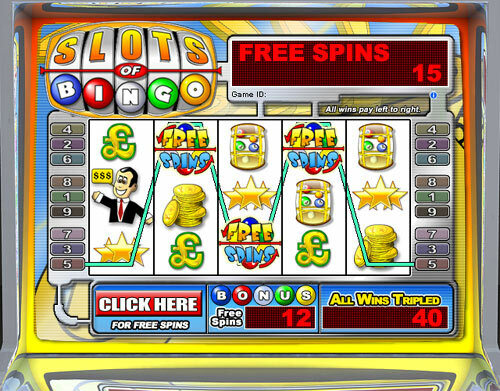 Free Spin feature is triggered when the player gets 3 or more Free Spins symbols ANYWHERE on the screen. This feature awards 15 free spins with the same number of lines and bet per line as the triggering spin. All wins during Free Spin feature are tripled. Getting 3 or more Free Spins symbols ANYWHERE on the screen during Free Spin feature gives another 15 free spins, added to the total remaining spins. Free Spins earned in Free Spins however, are not tripled; also the progressive jackpot is not tripled if won during Free Spins. All wins in combination with a participating Wild symbol will double. 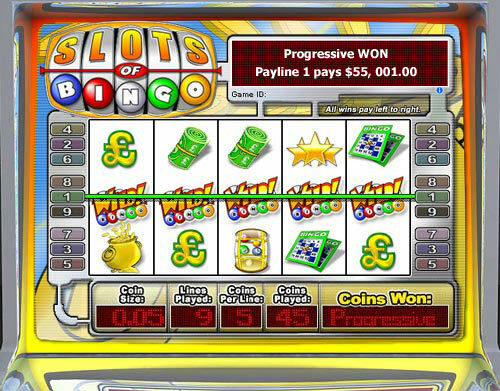 *The Player wins the Progressive Jackpot if he gets five Wild Symbols on any active payline. * The Player can win the Progressive Jackpot only for maximum number of lines and maximum number of coins per line. * The full Progressive Jackpot amount is only paid out when playing with MAX coin size, otherwise you will win only the portion of the jackpot. A coin size of 20p will win 100% of the Progressive Jackpot, but a 1p coin size will only win 5% of the Progressive Jackpot. The starting value of the progressive jackpot is $5,000. * If you get 5 Wild Symbols on any Payline with less than MAX coins (MAX number of lines x Max coins per line), you will win 4,000 times the number of Coins bet per line. * In the unlikely event that a progressive jackpot is won in consecutive spins by two different players, then the jackpot amount displayed may not have had sufficient time to correctly reflect the initial win. In this case the first player to hit the jackpot will get be awarded the progressive jackpot and the second player to hit the jackpot will be awarded the starting value as stated above. The Progressive Jackpot in funded by contributions taken from each game played. 0.84% Of the total bet of each game contributes towards the jackpot. Disconnection during a base game, where no wins occurred, will restore the game to its normal active state.If it was a winning base game the game is automatically completed and the next time the player logs back in to the game, the account balance is changed and reflects the result (previous balance + win amount from the game) and the game is restored to the normal active state. The winning state of the disconnected game is not shown on re-login. Disconnection during free spins will return the game to the state it was before disconnection, i.e. all winnings, free spins will be restored to the state prior to disconnection. If the game disconnects during a Progressive winning game the software will automatically complete the game.